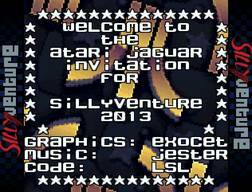 Nice invit' and long live to SillyVenture ! Okay for an invite, shame about the music. Another year, another Silly Venture! Press the red button! quite boring but platform thumb up. i loved it, not just the tune but the composition and that effect <3 jaguar! Wohoo! Works like a charm in Virtual Jaguar 2.1.1 in PAL mode and with no BIOS! page created in 0.080851 seconds with 16 queries.